CSIR NET exam is conducted for those students who want to make a career in lectureship and junior research fellowship. CSIR stands for Council of Scientific & Industrial Research (CSIR). The CSIR NET Exam conducted twice a year in June and December. The CSIR NET Exam will be held on 16th December 2018 on Sunday. If you are appearing for the CSIR NET exam, then you can check out all the important information about CSIR NET December 2018 in this blog. Here you get information about CSIR NET Exam Date, Online Application, Syllabus, Pattern and Eligibility. The CSIR NET December 2018 Exam online Application would start from October 2018. Candidates should apply online on CSIR-HRDG website: www.csirhrdg.res.in. The CSIR NET Exam Admit Cards would be available in the 1st week of December 2018. 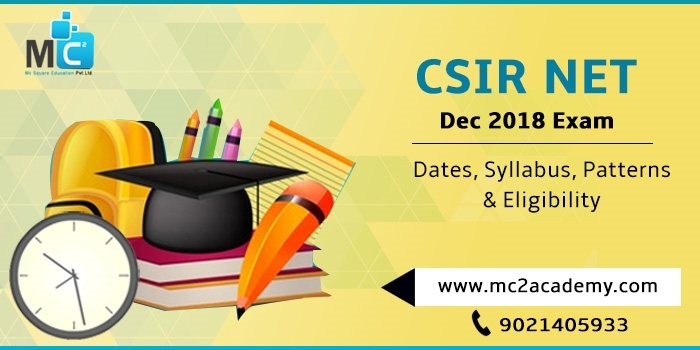 The CSIR NET 2018 Exam Date is 16th December 2018 (Sunday). The CSIR NET Exam MCQ based test will be holds on 16th December 2018. The Exam will be held in two session, morning 09.00 AM to 12.00 noon and afternoon 02.00 PM to 05.00 PM. Part A: This part shall be common to all subjects. This part shall contain questions on General Aptitude. Part B: This part contains subject related MCQ’s question. Part C: it contains higher value questions that may test candidate’s knowledge of scientific concepts and/or application of scientific concepts. Candidates should use only black ballpoint pen, not pencil to fill in their particulars in the OMR Answer Sheet. Negative marking for wrong answers. Nationality: Candidates must be an Indian National. Educational Qualification: Candidate should have M.Sc or equivalent degree/ Integrated BS-MS/BS-4 years/BE/BTech/BPharma/MBBS with at least 55% marks for General (UR) and OBC candidates and 50% for SC/ST, Persons with Disability (PwD) candidates. Age Limit: The maximum age limit prescribed for JRF should be 28 years. The candidates belonging to different categories, the relaxation will be provided to them. There is no upper age limit for Lectureship. The CSIR NET Exam test will be held at 27 Centers spread all over India like Bangalore, Bhavnagar, Bhopal, Bhubaneshwar, Chandigarh, Chennai, Cochin, Delhi, Guntur, Guwahati, Hyderabad, Imphal, Jammu, Jamshedpur, Jorhat, Karaikudi, Kolkata, Lucknow, Nagpur, Pilani, Pune, Raipur, Roorkee, Srinagar, Thiruvananthapuram, Udaipur and Varanasi.